CarGurus has 13,312 nationwide QX60 listings starting at $11,980. Flowing lines and curvaceous forms make this Infiniti a stylish SUV. The interior looks terrific, rendered in quality materials that don’t automatically remind the driver of the QX60's humble origins. Although it sprouts from mainstream Nissan roots, the Infiniti QX60 impresses in terms of style, simplicity, and the successful integration of useful infotainment and safety technologies. While imperfect, the QX60 also faces few direct competitors, making it easily worth consideration. However, as the luxury crossover segment grows in coming years, Infiniti will need to step up its game. Given the popularity of the crossover SUV, you’d think more of them would wear fancy nameplates. This relative rarity of upscale crossovers makes the 2015 Infiniti QX60 a member of an exclusive club, its most direct competitors including the Acura MDX, the Buick Enclave, the GMC Acadia Denali, and (of all things) the Lincoln MKT. Sure, there are other luxury SUVs that can carry up to 7 people, but they’re adept both on and off the pavement. Here, we’re talking about blacktop specials that come with optional all-wheel drive for when the weather gets nasty. While it's true that reduced competition can make any product more appealing, the Infiniti QX60 represents far more than a last resort. It began life for the 2013 model year, when it debuted as the JX35. An overhaul of Infiniti naming conventions transformed the JX35 into the QX60 for 2014. Based on the same platform and powertrain as the Nissan Pathfinder, the Infiniti QX60 is more than a simple re-badge. Unique styling, special interior design and materials, and technology not offered in the Nissan help to set it apart from its mainstream roots, in the same way that the QX60’s competitors are differentiated from the vehicles upon which they are based. Prices start at $43,395 (including the $995 destination charge), and rise to as much as $57,695 with every option. Peruse the menu of dealer-installed accessories to really pimp this ride, and the price scoots past $60,000. My test vehicle had four option packages and a set of accessory roof rails, bringing the total to $54,690. The Deluxe Touring Package requires the Premium and Premium Plus option packages, which install numerous comfort, convenience, and infotainment features. The Deluxe Touring Package adds bigger wheels, a premium Surround Sound audio system, an air-purifying climate control system, a dual-panel sunroof, ventilated front seats, and heated rear seats. The Technology Package adds a full suite of safety systems designed to prevent collisions. Painted a new color for 2015, Hermosa Blue, and featuring a new Wheat leather interior treatment that adds a black steering wheel, black carpets, and black lower door-panel trim for a high-contrast appearance, my QX60 test model had the 20-inch aluminum wheels that are included in the Deluxe Touring Package or available as a separate upgrade. They certainly make a difference, serving to make the QX60 appear less pudgy and more athletic. Far more flavorful than the Nissan Pathfinder, the QX60’s flowing lines and curvaceous forms help to make this Infiniti stand out as a stylish SUV. The interior looks terrific and is rendered in quality materials that don’t automatically remind the driver of the QX60’s humble origins. The high-contrast colors, the tastefully executed wood trim, and the silver and chrome accents successfully deliver an understated ambience of luxury. 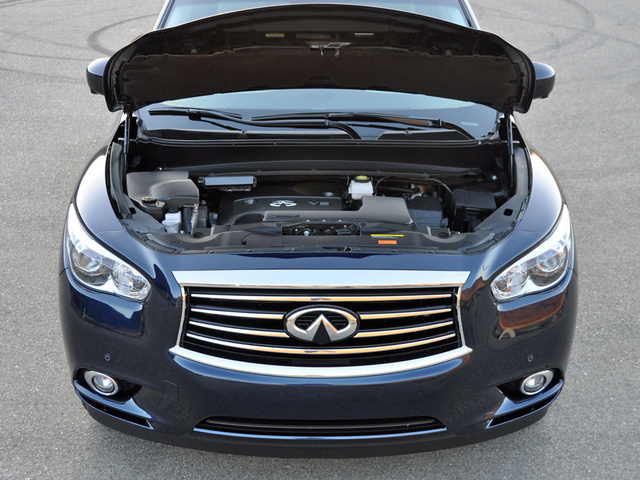 Employing a 3.5-liter V6 engine and a continuously variable transmission (CVT) that feeds 265 horsepower to the QX60’s front wheels, this Infiniti won’t get most people worked up over performance specifications. Don’t allow the modest engine output figure or the mention of a CVT dissuade you, though, because there’s more substance here than you might assume. Tried and true, this VQ-series V6 engine is a refined, smooth-revving motor that generates enough go power in the QX60. For 2015, the CVT gains new Enhanced D-Step Logic. Basically, that’s software designed to make it feel more like a traditional automatic transmission when the driver accelerates hard or chooses to manually shift between pre-programmed ratios. In short, this approach works. Only under full-throttle acceleration down short freeway on-ramps did the transmission exhibit anything close to a traditional CVT drone. On my normal testing loop, I averaged 18.9 mpg. That’s not terrible, but if you compare my result with official EPA ratings, you might bet that the feds are making up numbers. According to official estimates, my front-wheel-drive QX60 should have gotten 23 mpg in combined driving. I even used the powertrain’s Eco driving mode for most of my city driving. Like a Fitbit, the Infiniti’s Eco driving mode makes you hyper-aware of what you should be doing to improve. And then you turn it off, and guzzle down whatever you want without giving the indiscretion a second thought. Given the average level of driving talent that I witness on a daily basis, thank God for Infiniti’s approach. In order to crash this crossover, you’re going to need to try extra hard. However, if you’re test-driving a vehicle for a review, you pull over to the shoulder, shut off all the safety equipment (including the eager stability control), and then discover that beyond the electronic nannying there’s a decent level of entertainment to be had. Still, the QX60’s electric steering just isn’t right. With time, you get used to its numb, wooden, lifeless on-center feeling and oddly resistant, almost wobbly, off-center response. Bend into gracefully curving freeway transitions at speed, and unless the pavement is perfectly smooth, the steering wheel waggles in your hands, making the QX feel genuinely unstable. Personally, I like the QX60’s taut ride quality, one certainly emphasized by the bigger 20-inch wheels and tires. This sporty feel is entirely in keeping with Infiniti’s traditional brand character. Still, I can’t help but think that some luxury SUV buyers might wonder why so much of what’s happening at the surface of the road is making its way into the cabin. Infiniti needs to a better job of sealing the QX60, too, as wind and road noise prove excessive. 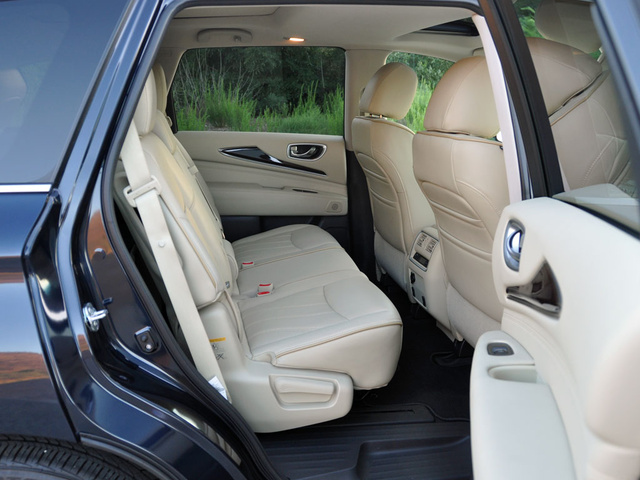 In terms of texture, tone, and finish, the QX60’s interior speaks the language of luxury. This crossover has an artfully rendered cabin, one that reminds me of fine modern furniture and home-entertainment equipment. You won’t think “Nissan” when you’re sitting in the driver’s seat, that’s for sure. Speaking of the driver’s seat, it's a terrific one. 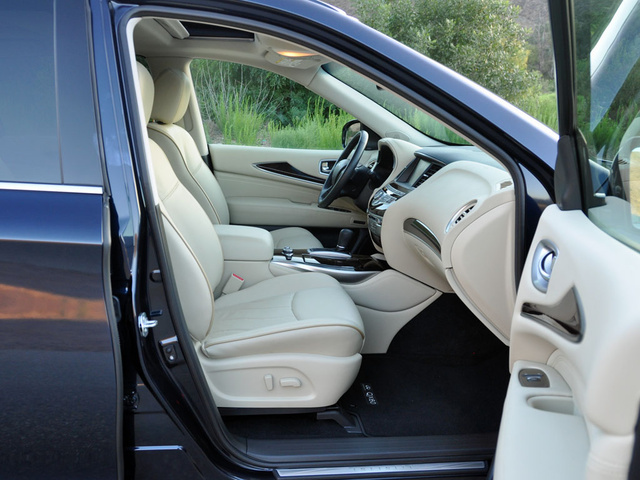 You sit in the plush, supportive seat rather than on it, and it's covered in quality leather. My test vehicle had ventilated front seats, perfect for July weather in parched Southern California. The front passenger’s seat is comfortable, too, but does not offer quite the range of adjustment enjoyed by the driver. If you’re sitting in the second-row seat, you won’t be quite as happy. Thanks to its ability to slide forward and back to make more room for people unfortunate enough to be stuck in the third-row seat, legroom is downright generous when the seat is moved to its rearmost position. Unfortunately, the bottom cushions are rather flat and lack thigh support, and there’s very little space for feet underneath the front seats. The third-row seat is best used for children. Thigh support is utterly lacking, leaving grown-ups to nosh on their knees during short journeys. Loading kids into the third-row seat is easy, though, thanks to a generous pass-through and the fact that Infiniti allows the second-row seat to move well out of the way even if a forward-facing child seat is placed in that second-row location. 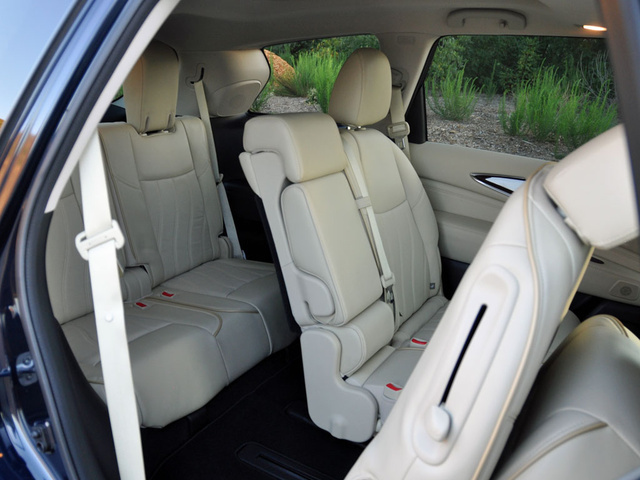 Most families who actually need to use a third-row seat on a regular basis will likely prefer to drive something other than a QX60. One reason is that Infiniti supplies just 14.8 cubic feet of cargo space behind the third-row seat, and that space is measured when stacking items vertically. Fold the third-row seat down, and the QX60 makes sense for a typical family, providing room for 5 people and as much as 40.8 cubic feet of cargo, depending on where the second-row seat is positioned. Maximum cargo space with both rear rows of seats folded down measures on the small side for what is supposed to be a midsize SUV, totaling 76.5 cubic feet. At the same time that there is no shortage of technology aboard an Infiniti QX60, there actually is. For example, the subscription-based Infiniti Connection service does not provide Wi-Fi Internet access for the QX60. The rear seat has no quick-charge USB port… heck, there aren’t any USB ports back there, and the one for the front seat is inconveniently located in the center console. You can’t plug in a laptop, either, as a 110-volt electrical outlet is absent. Oh sure, you get Infiniti InTouch Apps, which allows you to access specific smartphone applications right from the touchscreen infotainment system, but that’s not the same thing as Wi-Fi. While Infiniti is working on rectifying this situation, it might as well get the QX60 prepped for Apple CarPlay and Android Auto, too. Starting in 2016, those will be the new must-have standards. In order to get Infiniti Connection and InTouch Apps, the Premium Plus option package is required, which itself requires the purchase of the Premium option package. Combined, they bump the price QX60’s price tag to $47,945. Along for the ride are Bluetooth streaming audio capability, voice-recognition technology, a hard-drive navigation system, and a premium sound system. Pairing my smartphone via Bluetooth seemed unnecessarily complex in terms of the number of steps required, but was easy enough to do. Making calls, accessing music playlists, and streaming Pandora also proved easy. Better yet, one of my favorite things about the control layout is that the radio has knobs and buttons for power, volume, tuning, and station pre-sets. The climate system is also separated from the dashboard’s touchscreen, so once the QX60’s driver has everything set up to his or her preferences—and Infiniti provides numerous ways to program the on-board technologies—interaction with the screen is minimalized. In my book, that counts as true luxury. From its standard stability-control system to its optional Lane Departure Prevention system, the QX60’s safety technologies work overtime to make sure you don’t get into a collision. Better yet, you can tailor them to personal preferences, making it less likely that you might shut them off due to irritation. The exception to that irritation rule is related to the Distance Control Assist, Blind Spot Intervention, and Lane Departure Prevention systems. A button located on the steering wheel allows the driver to quickly turn them on or shut them off, and unless you have no business possessing a driver’s license in the first place, you’re likely to shut these intrusive technologies off and leave them that way. • You suffer failing vision but just can’t bring yourself to alter your fabulous looks with a pair of geeky glasses. If any of these statements apply to you, please get a QX60, get the safety equipment, keep it turned on, and then just get into the right lane and leave the rest of us alone. Previously, I mentioned that unless you’re really trying to wreck a QX60 equipped with the Technology Package, it’s hard to suffer an at-fault accident. If you are involved in a collision, rest assured that the QX60 will do its best to protect you. This Infiniti earns a 5-star overall crash-test rating from the NHTSA and a Top Safety Pick accolade from the Insurance Institute for Highway Safety. Plus, with an active Infiniti Connection subscription, the QX60 has automatic collision-notification service and an emergency calling system. Upgrade to the pricier Plus package of services to enjoy speed and geographic boundary alerts, which are great for households with teen drivers. According to ALG, the Infiniti QX60 should retain a good chunk of its value over time. This is a bright spot in an otherwise dismal outlook for this crossover’s value proposition. During my testing, I missed the EPA fuel economy estimate by 4.1 mpg, coming in at 18.9 mpg instead of anywhere near the official 23-mpg rating. Infiniti previously offered a hybrid version of the QX60, but that model has been discontinued. If you can still find one on a dealer’s lot, it might be worth the upgrade if fuel efficiency is important to you. Advertised deals are competitive, but not enticingly so. Consumer Reports appears not to be a fan of the QX60, and while J.D. Power provides a rosier outlook in terms of reliability, neither market research firm finds QX60 owners gushing about how much they love their SUVs. Based on personal experience owning a Nissan Murano with an older version of the QX60’s V6 engine and comparatively antiquated CVT technology, this Infiniti should prove durable. Whether or not you like how the CVT shifts, or how the onboard technology works, both factors which could contribute to lower scores on Consumer Reports and J.D. Power surveys, is a different matter entirely. Until luxury automakers offer more alternatives to the QX60 (Lexus, you really screwed up by not making the 2016 RX 350 a 3-row model), this Infiniti deserves consideration. An Acura MDX is more entertaining to drive, and a Buick Enclave is bigger inside, but the Infiniti QX60 successfully combines simplicity, quality, style, safety, and technology in an appealing package. Just don’t let this one simmer for much longer, Infiniti. 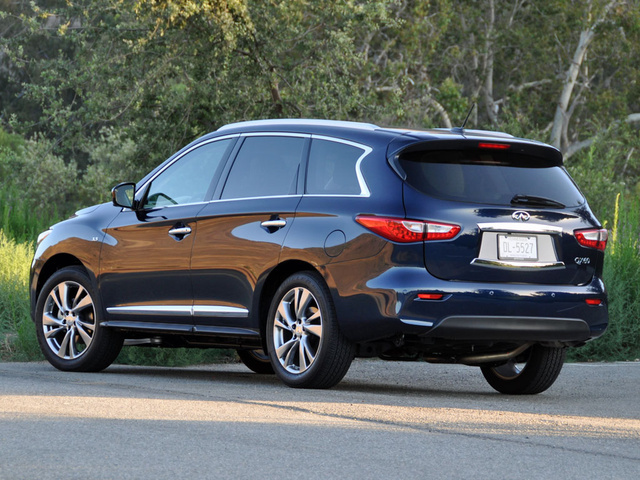 What's your take on the 2015 INFINITI QX60? 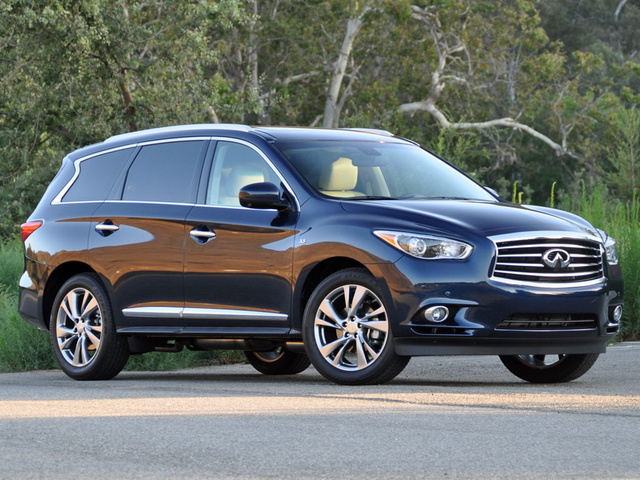 Users ranked 2015 INFINITI QX60 against other cars which they drove/owned. Each ranking was based on 9 categories. Here is the summary of top rankings. 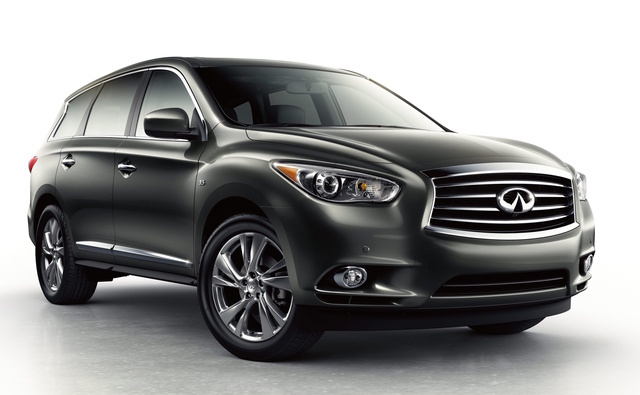 Have you driven a 2015 INFINITI QX60? Can I return a car that I purchased less than 72 hours What should I do? Can you upsize tires on an Infiniti QX60 from 235/55/20 to 255/55/20?